Here at Funk/Levis, we work with clients who have different style guides covering the “Oxford comma,” that “extra” comma between the second and third item in a list. Many of us learned in school this comma was optional in our writing. 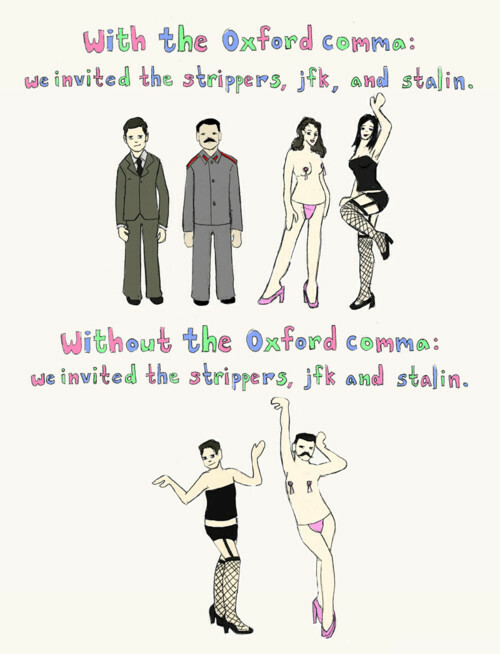 I typically err on the side of clarity and include the Oxford comma in my writing. So why are we talking about comma use in a blog that typically focuses on bigger and broader issues? Perhaps because President Obama and Raul Castro do not have a date set to be married, as Sky News recently announced. I prefer my eggs, toast, and orange juice a little more separate when I eat breakfast. And Stalin and JFK would be really bad strippers. So can we just agree the Oxford comma has its place and provides clarity to sentences?